Scott has a fundraiser in Dallas on Tuesday. 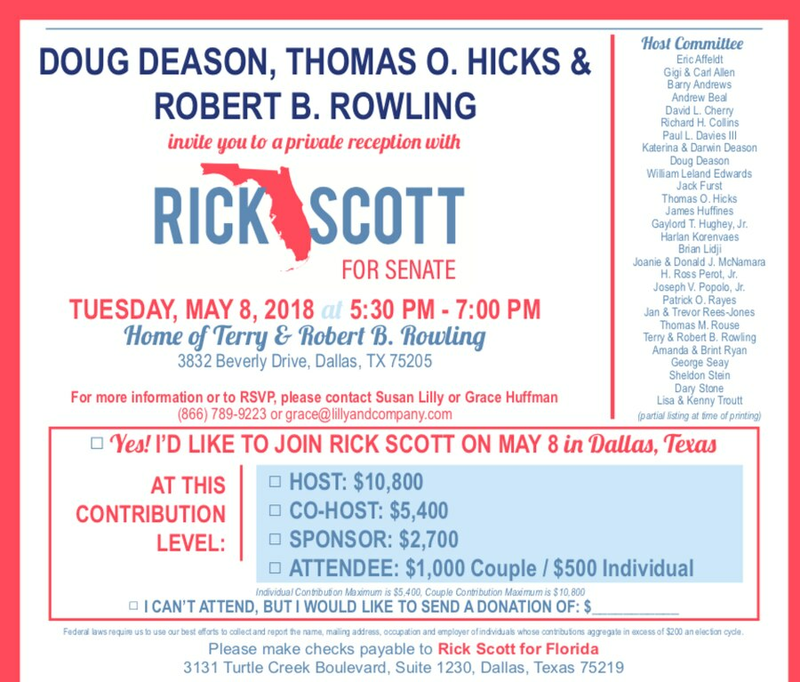 Rick Scott will fundraise Tuesday in Dallas, according to an invite. It's being hosted by Doug Deason, Thomas O. Hicks and Robert B. Rowling, with admission starting at $500. Scott has been aggressively fundraising, including a recent visit to Chicago, as he looks at an expensive, TV-heavy campaign. Rowling controls TRT Holdings, which is connected to Omni Hotels, Gold's Gym and Tana Exploration Co., an oil and gas business. Scott knows Dallas well, having gone to law school at Southern Methodist University and working at the city's largest firm, Johnson & Swanson, "primarily representing companies in the health care, oil and gas and communication industries," according to his bio. "In 1987, while still practicing law, Gov. Scott made an offer to purchase HCA, Inc. When the offer was rejected, Gov. Scott started Columbia Hospital Corporation with his and Ann's entire life savings of $125,000."